Travelling alone can bring a number of pleasurable benefits - going where you want when you want chief among them - but it also means that the solo traveller shoulders a lot of responsibility. Finding transportation, safe food, clean rooms and trustworthy travel partners are just a few of the challenges presented every day when travelling alone. 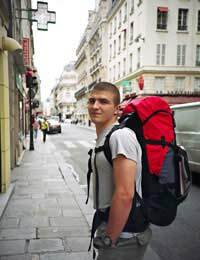 If you are considering travelling alone during your gap year, take heed of the tips below. Travelling alone is not for everyone, and it's better to know this sooner rather than later during your gap year. Before you splash out on the adventure of a lifetime, try a dry run at home to see how you fare. Spend several days in a city with which you are unfamiliar. How do you get on with hostels, public transportation and eating alone? If you don't want to go to a city try going camping by yourself. Does the tranquillity sooth you or frustrate you? Join a short group tour. Do you enjoy travelling with strangers? Or take a solo mini-break. How much do you enjoy solitary international travel? Even if you are travelling alone, others can help keep you safe even from a distance. When you decide on your itinerary choose hotels and hostels with good recommendations and in central areas and leave a copy of all of your travel information and your passport identification page with a trusted relative or friend at home. Arrange dates by which you will check in with designated people and make sure someone else keeps a copy of your medical records and insurance information. Pay a Little Extra - Your Life is Worth It! Often those travelling during their gap year are on a tight budget and this is understandable. But if you are travelling alone, spending a little more will give you piece of mind and physical safety. Splurge on registered taxis and buses when arriving in a new area and never get into a taxi you have waved down in the street. Ask your hotel/hospital to recommend transfers from airports.Hire a guide if you are planning to travel to remote sites. Always stick to your itinerary and never take "discounted" hostel or rooms from locals. Even if you'll be travelling with your whole life shoved into one bag, keeping an eye on your belongings is essential to remaining safe when travelling alone. Always keep your passport and wallet on your person and consider wearing your backpack on your chest in crowded areas, as if it is on your back you wouldn't feel someone un-zipping your bag to steal your things.Keep your bag on your lap, or by your feet with the loops around the chair legs while on public transportation and in restaurants. If your hostel or hotel provides a safe use it! If you are leaving valuables unattended, place them all in a sealed envelope so you will know if someone has been tampering with it when you return - leave expensive jewellery and electronic accessories at home.Finally carry all prescription medications in properly labelled bottles so that you and anybody else know exactly what they are. Women travelling alone may be common in the West, but it may be highly unusual in more remote areas. If you are a woman travelling alone remember that make up and clothing styles differ, and endeavour to dress appropriately at all times. You should respect tourist regulations, particularly at holy sites, even if they seem unfair. Do not announce or publicise that you are travelling alone, avoid wearing expensive jewellery and consider investing in a cheap "wedding ring" to wear during your travels, so as to avoid unwanted attention. Make sure that any hotel or hostel room has adequate locks on the doors and windows (male or female this is a priority).Move confidently, do not stop to look at maps, ask directions, or hesitate to get back to a more crowded area if you feel exposed. Travelling alone can bring both great joy and great responsibility. If you are considering travelling alone, make sure that you keep in touch with others, keep your belongings with you at all time, and keep to a prearranged schedule. Registering at the embassy in the countries you are travelling to, and arranging check-in emails or phone calls with relatives and friends will help everyone remain aware of your activities. Stay safe and have fun!